The Open Door Day Programme has six sections in which children aged 3 – 18 are placed depending on their skills, needs and chronological age. AFA has expanded the Open Door Day school program with a bunch of new admissions. These are students from the surrounding community and all from socio economically disadvantaged backgrounds. The new admissions include students who come with a range of developmental conditions including autism, learning disability, intellectual impairment and so on as well as other disabilities. The program has also expanded the number of classes adding Yellow and Orange classes to the existing ones, with existing and new students spread across all the classes. The students participate in various activities to promote motor skills, imitation, communication and language, social skills, self-help skills, prevocational and cognitive skills. Activities vary from day to day and always incorporate the maxim of ‘learning through fun’, as they are conducted with the 4E’s: Energy, Enthusiasm, Excitement and Enjoyment. Since all the activities are experiential, they motivate the child to participate in the learning process. Snack time provides excellent opportunities to work on self-help skills, communication skills and to broaden food interests. Free play, games and leisure, primarily target the socio-communication skills. From the early years, children learn to use the computer for educational, prevocational and recreational purposes. Making choices, something that bolsters both self-esteem and independence, forms an integral part of the daily routine. The teaching is done through structured educational aids, video modelling, power point presentations, interactive CDs and apps etc. There is also an active focus on the children participating regularly in competitive events at other schools, excursion trips, picnics and camps. Expectations in all activities, for each child, are individualized according to the child’s skills and needs. In all our classrooms, at the Open Door Day Programme, we use a mix of various internationally recognised ‘best teaching’ methodologies like Structured Teaching, ABA, VBA. All the components of structured teaching are in place so as to decrease anxiety levels of the students by giving them visual clarity and predictability and in turn enhance their independence. The physical environment is well demarcated to offer visual clarity and specify what each particular area will be used for; every student has his/ her individualized schedule. Visual structure in the teaching methods through the use of clear cut teaching aids, worksheets etc, ensure that the student faces no ambiguity with regards what is expected from him/her whilst doing any task. All the efforts of the students are appropriately reinforced, so as to ascertain that the motivation levels remain high and the learning continues at a steady pace. Alongside, Augmentative and Alternate modes of communication like communicating through an iPad, sign systems, visual supports, and communication boards are used to facilitate communication throughout the day. Based on the current level of performance and the priorities of the parents, each student’s Individualised Education Plan (IEP) is individually designed. The IEP’s are reviewed twice a year. To ensure that the intervention strategies are continued at the home environment as well, something that is essential for the child’s progress, all parents are encouraged to work with their children in the classroom, so that they can be provided with ‘hands on’ training with the intervention strategies with their respective child. 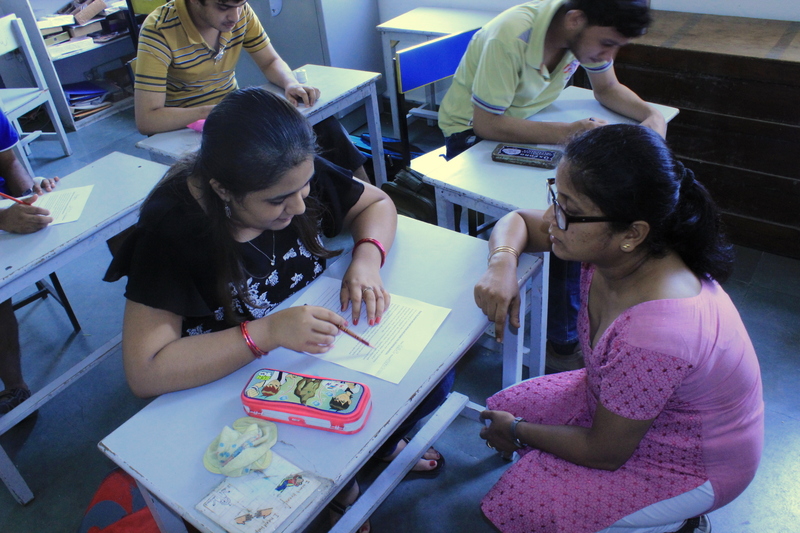 Parent Teacher Meetings are conducted on a regular basis to discuss the child’s progress, apprise the parents of upcoming school events and to provide inputs for any difficulties that the parent may be facing with regards the child’s learning or behaviours.